Brandon Ingram could lead Duke on a deep tournament run, and that could propel him to overtake LSU's Ben Simmons as the No. 1 pick in the NBA draft. PROVIDENCE, R.I. — Brandon Ingram’s sinewy 6'9" frame, uncanny fluidity and knack for scoring flourishes bring inevitable comparisons to Kevin Durant. UNC-Wilmington coach Kevin Keatts made the analogy on Wednesday, calling Ingram the “closest thing I’ve seen” to Durant. 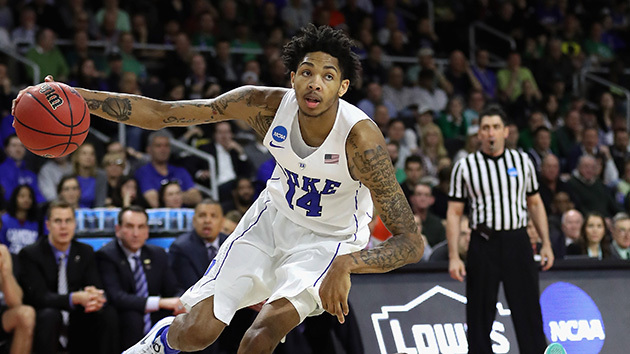 NBA scouts note Ingram’s 190-pound frame and can’t help but compare them. Even Ingram himself admits that he studies the 6'9", 240-pound Durant’s game and considers the Thunder forward an idol. In the two-man race for the No. 1 pick in the NBA draft between Ingram and LSU freshman forward Ben Simmons, it’s already clear who better used his time in college. Ingram played like a future No. 1 pick against UNC-Wilmington on Thursday afternoon, guiding the No. 4 seed Blue Devils past the plucky and pressing No. 13 Seahawks, 93–85. Ingram spun through the lane possession after possession, soaring high only to touch the ball softly off the glass. He finished with 20 points, nine rebounds and two blocks and continued to close the gap between himself and Simmons. While Simmons’s season sputtered to a disappointing conclusion in a blowout loss to Texas A&M in the SEC tournament, Ingram is still soaring in both the lane and the draft boards. In the one-and-done era, collegiate legacies are manufactured quickly. All of the themes of a generation ago in college basketball—learning from mistakes, maturing through failures and growing physically—are crammed into a six-month crash course. That sped-up timetable often ends with a fittingly manic final exam—the NCAA tournament—that could last three hours or three weeks. Whether the No. 1 or No. 2 pick, Ingram’s future is already secure. Ingram, 18, is so young that he owned a Nolan Smith Duke jersey growing up. Smith finished his Duke career in 2011. Ingram spent his first summer at Duke pounding peanut butter and Muscle Milk to add weight. Duke’s spree of departures to the NBA combined with a run of injuries this season, especially to senior forward Amile Jefferson, sharpened his learning curve. The Duke coaches holding him accountable and forcing him to play defense and be aggressive pushed his development. “It put Brandon in the position to be taught by the best basketball teacher out there,” said Donald Ingram, Brandon’s father. Donald Ingram didn’t make the trip to Providence for Thursday’s game. He spoke from his job as a service coordinator at Crown Forklifts in Kinston, N.C. He’s hoping that Duke can reach the Sweet 16 so he can travel to Anaheim to watch them. Duke will need to get past either No. 5 Baylor or No. 12 Yale to go to California. This is a flawed Duke team, limited to a six-man rotation and porous defensively. But Ingram’s performance on Thursday—combined with an inspired career high 23-point outburst by senior center Marshall Plumlee—reminded everyone the searing potential of a superstar in the NCAA tournament. Ingram’s season at Duke has already secured his future for the long-term. For now, though, he looks mighty impressive trying to extend his college career, one victory and showcase at a time.